How will one describe an experience where the sojourn is as intriguing as the destination itself? Indian luxury train transfer you to your destination but in a unique manner. There is nothing better than these luxury trains when it comes to extravagance and lavishness. Traveling like royalty is no more a dream now. Red carpets, royal carriages, silverware and all the comforts you can think off, luxury trains in India feature them all. History of the luxury trains in India dates back to the British Raj. It was during the bygone era, that the Maharajas of India got attracted towards the concept of travelling in the lap of luxury. Being born and brought up into royalty, the Maharajas started flaunting their royal status by creating most luxurious carriages. Private suites, salons, air conditioners (electric fans that blew air over blocks of ice) and even billiard rooms were added to the carriages. All the royal carriages were ceased to be used after India got independence in 1947. It was not possible to add these in the normal passenger trains due to their valuable furnishings which needed heavy maintenance cost. But, it was on 26th January 1982 that India's tryst with luxury train journeys started once again with the launching of Palace on Wheels train. Since then, luxury trains has been adding stars into their profile one after another. There are four luxury trains in India offering incredible ways to explore the country like never before. Read on to know about them in a brief and distinctive manner. The pioneer of the Indian luxury trains, the Palace on Wheels was introduced in 1982. It was due to a remarkable collaboration between Indian Railways and Rajasthan Tourism Development Corporation, that the train was launched to promote Rajasthan tourism. Nothing comes closer to the royal train tour on Palace on Wheels that navigates along picturesque routes adorned with historical landmarks. The luxury rail in India has won many awards which include PATWA award in 2018, voted as the ‘Best in Asia’ in 2009 and PATA Gold Award in 1987. Deriving their name from the former princely Rajput states, there are 14 meticulously-designed coaches. Each coach is equipped with 4 twin bedded cabins featuring ethnic Rajasthani décor. State-of-the-art facilities give you an opportunity to pamper yourself even when you are on the move. A personal attendant called as 'Khidmatgar' is available in each saloon to cater the needs of the guests 24*7. Each saloon also houses a mini pantry and a lounge equipped with DVD player, television and small library. Cold and hot beverages are served to guests along with refreshments. There are two restaurants onboard. A spa, a lounge car and a small gym are also available. Running from September to April annually, the Palace on Wheels covers 7-night long routes, departing and returning to Delhi. But, this can also be customized from Delhi to Jodhpur lasting for only 5 nights. This moving palace crisscrosses through the royal land of Rajasthan covering amazing destinations. Reckoned as the most opulent and exclusive of all the four luxury trains, Maharajas’ Express is excellence at par. Giving the Orient Express of the West a run for money, this elite train is redefining the luxury train travel in India since 2010. The train crisscrosses some of the renowned destinations offering a glimpse of rich cultural heritage of India. The royal sojourn will bestow you with loving memories of the train to be cherished forever. The train boasts of various accolades including CNBZ AWAAZ Travel Award for Best Luxury Train in 2010 and 2015, World Travel Award from 2012 – 2017 and Seven Stars in 2015 and 2016. The half-a-mile long Maharajas’ Express consists of 14 carriages with 43 individual cabins. Guests can settle in the comforts of 5-star equivalent accommodation in 20 deluxe cabins, 18 junior suites, 4 suites and a presidential suite. Dine like royals at the two dining cars with modern kitchen car designed to offer a gastronomical experience. Choose from a fine selection of wines, spirits, liqueurs and beers available at the well-stocked dedicated bar carriage. Facilities like Wi-Fi, attached bathroom, live television and souvenir shop will render guests speechless. Seven meticulously designed itineraries help you to embark on a saga of adventure, elegance and romance. 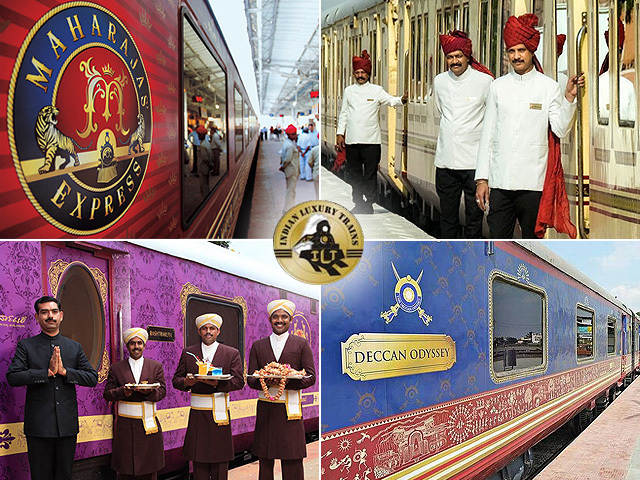 Indian Railways had joined hands with Cox & Kings to come up with the Deccan Odyssey, another finest luxury trains in India. Treat your eyes to the beauties of Goa and Maharashtra. The grandeur of the royal train is apparent in the majestic environment, lavish interiors, strict security arrangements and almost everything you can think of. The very sight of Deccan Odyssey painted in blue, casts a spell on the passengers. Step into a world overflowing in luxury, while oozing an aura which takes you back to the days of kings and queens of bygone era. The 12 guest coaches of this Indian luxury train echo the penchant of the erstwhile Maharajas. Each of them come fully packed with facilities of a 5-star hotel. The coaches are elegant, spacious and designed flawlessly to exude the various eras of the Deccan dynasties. A specially equipped cabin is dedicated to the differently-abled guests. ‘Pankh’, the conference car can cater to all the business needs. Spend your time on-board by indulging in various activities like savoring scrumptious food at multi-cuisine restaurants or enjoy relaxing massages at the spa. A journey aboard Deccan Odyssey includes excursions to the UNESCO World Heritage Site, a palatial residence, stunning vineyards, tranquil backwaters and sun-kissed beaches. All the six tours offered by the Deccan Odyssey takes you on a voyage like no other. The train is operational from September to May. Deriving its name from the famous ‘Stone Chariot’ at the Hampi, the Golden Chariot makes its way to some of the UNESCO World Heritage Sites, tranquil beaches and wildlife sanctuaries. The elite luxury train of India cater to the needs of guests who wish to discover the rich cultural heritage of India without giving up the comforts of the luxuries. Experience world-class hospitality and bask-in the beauty of natural scenery of South India. Adorned with purple and golden compartments, the award-winning train presents a sight to behold. After completing a majestic run of a decade, the regal train is being revamped to beguile you with its grandeur. The Golden Chariot enjoys winning the award of ‘Asia’s Leading Luxury Train’ in 2013. Visually appealing interiors complement the quaint landscapes. Deccan Odyssey comprises of 11 guest cabins which have derived their names from the ruling dynasties. The cabins are intricately designed and are furnished with stylish Mysore-styled furniture. In-house fine-dining restaurants, an Ayurveda spa and wonderful ambience of the lounges are just a few add-ons which make you feel like royalty. From en-suite washrooms, lounge, Wi-Fi internet, two dining cars, to the lounge, you’ll be spoilt for the choice of comforts available onboard. Two tastefully crafted itineraries are offered by the Golden Chariot which provides its services in the months of October to March. Choose any of the Indian luxury trains, a wonderful expedition is guaranteed.